When you hire a professional caregiver through a trusted agency who’s been thoroughly background checked to help care for an aging loved one, you don’t expect theft – but unfortunately, it does happen. As a reputable and trusted Bay Area in home caregiving agency, we want to share some of the key warning signs you should be aware of that could indicate things aren’t as they should be with your paid caregiver. The relationship between your loved one and the caregiver seems a little too emotional or personal. It isn’t unusual for those who are aging to develop bonds with their caregivers; after all, many are together for several hours a day. However, if your loved one begins to talk about the caregiver incessantly or as if he or she is family, or begins to become too dependent on the caregiver, pay close attention. Some caregivers become overly affectionate purposely in an effort to build an intimate connection, which often results in the senior giving “gifts” or loans. Questionable receipts. Mom doesn’t wear eye shadow, yet you see an $8 expenditure on her grocery shopping receipt. Also pay attention to supplies that seem to be purchased too regularly, or that are missing from your loved one’s home such as dish soap, paper towels, OTC pain medications, etc. It’s important that you confront the caregiver even on a small issue, as some may “test the waters” to see if they can get away with it. If you say nothing, they may continue to pad their paychecks through theft. Tales of woe and frequent family issues. Certainly a caregiver can have a child who needs glasses, but he or she can’t afford it. 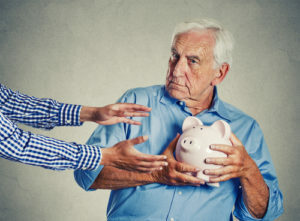 However if the caregiver constantly seems down on her luck and shares stories in an effort to evoke sympathy, it could be a ploy to get into your aging parent’s bank account. Seniors are often sympathetic and may write out a sizeable check to “help out.” This is a form of theft – don’t put up with it. These are just a few common examples of how unethical caregivers may commit theft and get away with it. If it seems your caregiver misses a lot of Mondays, it could be he or she has “binged” or partied too much over the weekend. Why is this important? If your loved one stores any alcohol or prescription pain medications in his or her home, it could be supplying the caregiver with party items. Take a look at these items if Monday seems to be a day your caregiver misses on a frequent basis. At Care Indeed we hire only the most trusted, compassionate caregivers to provide services to clients. Still, no matter how rigorous the hiring process is and how many checks are performed prior to hiring, a “bad apple” can always slip in occasionally. Whether your senior lives in Palo Alto, Walnut Creek, San Jose or anywhere in the East Bay Area, count on our in home care giving services to go beyond your expectations.